A major incident has been declared as the fires on Winter HIll and Scout Road have merged. We strongly urge motorists and pedestrians to adhere to all road closure signs as they are there for your safety. They are also in place to ensure that emergency services have clear access to continue tackling the fire. 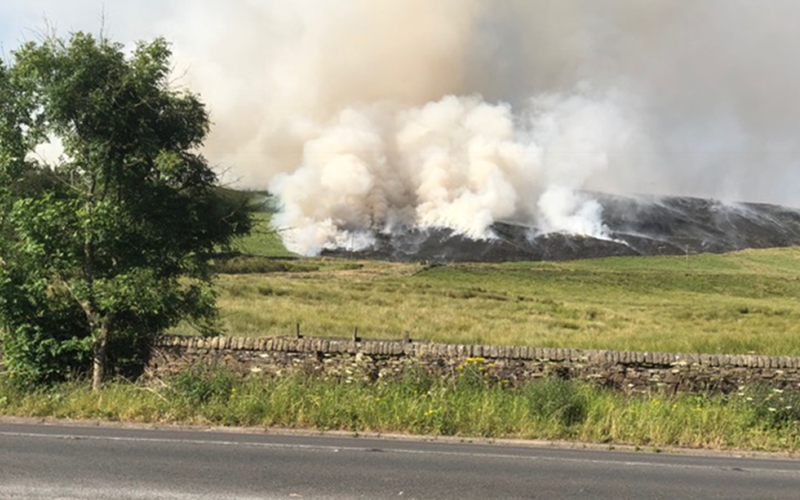 Lancashire Fire and Rescue Service and Greater Manchester Fire and Rescue Service were previously fighting two separate fires on either side of Winter Hill. At midday today the fire in Manchester accelerated due to increased wind speed causing one single fire. A major incident was declared and it is now being treated as one incident. The emergency services are working together with colleagues in local authorities, public health and the Environment Agency to respond to the incident jointly to ensure the safety of the public and responders. Fire engines from Lancashire and Manchester are in attendance along with specialist wildfire fighting teams, a drone and mountain rescue units. A United Utilities helicopter is also in operation. These resources are attempting to protect the infrastructure on top of Winter Hill. Members of the public should stay away from the area affected for their safety. Residents in areas affected by smoke are advised to stay indoors, keep doors and windows closed and tune in to the local radio station and social media for advice and information. Motorists who have to travel through the smoke should keep windows closed and switch air conditioning systems to recycle or recirculate to prevent drawing in outside air. If people need to be outdoors, they are advised to avoid areas affected by any smoke or ash, or to limit the time that they spend in them. Members of the public wishing to make donations for responders should drop them off at Lancashire Fire and Rescue Service Training Centre, West Way, Euxton, Chorley, PR7 6DH which is open Saturday and Sunday, 8am until 4pm. As firefighters respond to the moorland fire on Winter Hill, be reassured that more are there in readiness 24/7 to deal with other emergencies when required. Help them by ensuring that no other grass or moorland fires start. Don’t go near to dry grass with naked flames. Responders at the scene are supported by the Salvation Army and Rapid Relief Teams.